Donna Kouri, a familiar face on this blog during our yearly reading road trip, hosted three energetic authors during this year's Naperville Reads celebration. Donna dropped by to chat with me about her successful event. I wrote the words in red, and she wrote the words in black. Thank you, Donna! Naperville Reads is a wonderful annual event that draws the community together in a celebration of literacy. Students throughout town read books by the same author and each year a grade is selected to attend a presentation by this author. It is a perfect chance to celebrate fabulous literature and to build community by doing so. Most years both an adult author and a children’s author are selected. This year instead of one author, Naperville Reads hosted twelve authors! 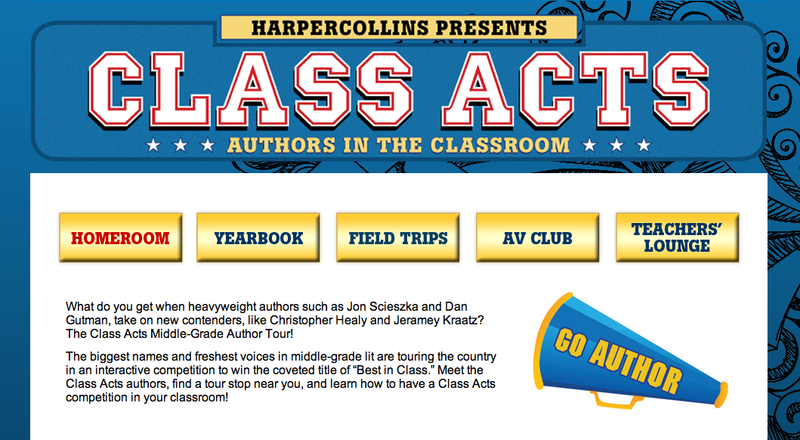 Harper Collins sent in twelve Class Acts authors to do presentations throughout the community. These authors formed of teams of three and went to schools to entertain students with a game show type presentation that can be best described as a literary smack down. The Class Acts is a highly engaging program. Students learn about three authors and have fun participating in a game show where the winning team is awarded a set of Class Acts books. Laughter and hijinks abound during a Class Acts assembly. It is truly a reading rally and is so much fun to be part of. Jeramey Kraatz’s The Cloak Society is a suspenseful trilogy that explores good vs. evil. It is full of heroes and villains and is perfect for that student who loves comics but wants a novel to read. Jeramey Kraatz created characters with unique powers that keep the reader’s attention page after page. It has been a favorite in our library since Jeramey Kraatz first visited our school last year. Tim Green told my students that sports are wonderful but the lessons you learn from sports are even more powerful. Sports teach you compassion, kindness, and teamwork. It is great to be good at sports but it is even better to be kind. He discussed RJ Palacio’s Wonder with students and told them it was a life-changing book that all students should read. The Seven Wonders series is full of excitement and suspense. Fans of the 39 Clues series flock to this series and eagerly await the release of new installments. We prepared for the Class Acts authors by learning about each one. We learned their background and read excerpts of their books. We watched book trailers and excitedly awaited the day they would visit our school. The 5th grade represented Team Tim Green and dressed in sports attire and the 4th grade represented Team Jeramey Kraatz and dressed as superheroes and villains. Mr. Schu, you should have asked me about the generosity of HarperCollins. They sent twelve authors instead of one. The authors remained in Naperville for most of the week, which allowed over 8,000 students to see them in the school setting. It allowed Naperville Reads to reach a whole new level. You should also have asked about some of the shenanigans that occurred during the evening events. Who knew Jeramey Kraatz and Chris Krovatin could look so fabulous in wigs?